Apple - iMac 2.0GHz Core 2 Duo 20” Anodized Aluminum (MA876LL/A) - 1024 MB - 4096 MB - 2 - PC2-5300 DDR2 SDRAM SODIMMs. 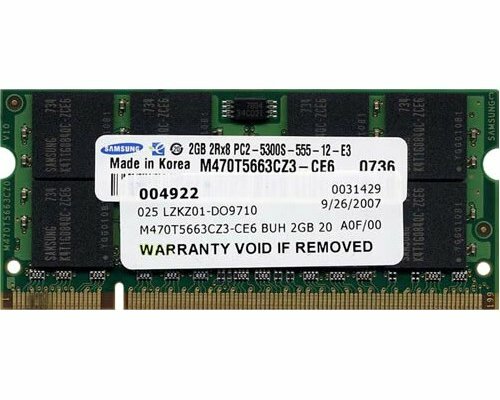 Supports Dual Channel DDR2. Apple - iMac 2.4GHz Core 2 Duo 20” Anodized Aluminum (MA877LL/A) - 1024 MB - 4096 MB - 2 - PC2-5300 DDR2 SDRAM SODIMMs. Supports Dual Channel DDR2. Apple - iMac 2.4GHz Core 2 Duo 24” Anodized Aluminum (MA878LL/A) - 1024 MB - 4096 MB - 2 - PC2-5300 DDR2 SDRAM SODIMMs. Supports Dual Channel DDR2. Apple - iMac 2.8GHz Core 2 Duo Extreme 24” Anodized Aluminum (Z0FC) - 4096 MB (2 x 2 GB) - 4096 MB - 2 - PC2-5300 DDR2 SDRAM SODIMMs. Supports Dual Channel DDR2. Apple - MacBook Pro 1.67GHz Core Duo 15.4” (MA090LL/A) - 512 MB - 2048 MB - 2 - PC2-5300 DDR2 SDRAM SODIMM 200-pin. When installed in pairs, SODIMMs must be the same size and type. Apple - MacBook Pro 1.83GHz Core Duo 15.4” (MA091LL/A) - 1024 MB - 2048 MB - 2 - PC2-5300 DDR2 SDRAM SODIMM 200-pin. When installed in pairs, SODIMMs must be the same size and type. Apple - MacBook Pro 1.83GHz Core Duo 15.4” (MA463LL/A) - 512 MB - 2048 MB - 2 - PC2-5300 DDR2 SDRAM SODIMM 200-pin. When installed in pairs, SODIMMs must be the same size and type. Apple - MacBook Pro 2.0GHz Core Duo 15.4” (MA464LL/A) - 1024 MB - 2048 MB - 2 - PC2-5300 DDR2 SDRAM SODIMM 200-pin. When installed in pairs, SODIMMs must be the same size and type. Apple - MacBook Pro 2.0GHz Core Duo 15.4” (MA600LL/A) - 512 MB - 2048 MB - 2 - PC2-5300 DDR2 SDRAM SODIMM 200-pin. When installed in pairs, SODIMMs must be the same size and type. Apple - MacBook Pro 2.16GHz Core Duo 15.4” (MA601LL/A) - 1024 MB - 2048 MB - 2 - PC2-5300 DDR2 SDRAM SODIMM 200-pin. When installed in pairs, SODIMMs must be the same size and type. Apple - MacBook Pro 2.16GHz Core Duo 17” (MA092LL/A) - 1024 MB - 2048 MB - 2 - PC2-5300 DDR2 SDRAM SODIMM 200-pin. When installed in pairs, SODIMMs must be the same size and type. Apple - MacBook 1.83GHz Core Duo 13.3” (MA254LL/A) - 512 MB - 2048 MB - 2 - PC2-5300 DDR2 SDRAM SODIMM 200-pin. When installed in pairs, SODIMMs must be the same size and type. Apple - MacBook 2.0GHz Core Duo 13.3” (MA255LL/A) - 512 MB - 2048 MB - 2 - PC2-5300 DDR2 SDRAM SODIMM 200-pin. When installed in pairs, SODIMMs must be the same size and type. Apple - MacBook 2.0GHz Core Duo 13.3” (MA472LL/A) - 512 MB - 2048 MB - 2 - PC2-5300 DDR2 SDRAM SODIMM 200-pin. When installed in pairs, SODIMMs must be the same size and type.